Albert Edward Oliver was one of two brothers who joined the army during WW1 and were recorded on the Muston Absentee Voters list. The other was Cecil Charles Oliver. Few details of the war service or subsequent life of either of these men have been discovered so far. There were also three more brothers, William, Alfred and John, but no records of war service of them have been discovered. Albert Edward Oliver was born in Sedgebrook, Lincolnshire, in 1897. His father, John Oliver, was born in 1847 in Muston: his mother, Mary (nee Bond), in 1857 in Great Gonerby. They were married in 1876, in the Grantham area. In 1901, the Oliver family lived at Welborne’s Barn, in Woolsthorpe, Lincolnshire. John Oliver worked as a farm waggoner. There were five sons and one daughter at home: William (22, born in Muston, a rope runner), Alfred (19, an ironstone miner), Kate (16, a domestic servant), John F (13), Albert E (4) and Charles C (3). In 1911, they lived close to the Challands family on Green’s Lane, Muston. John Oliver was now 64 but still working as an agricultural labourer. Their oldest son, William (married, aged 33), was at home with his daughter Ethel (5), in addition to Albert (14, at work as a dayboy farm labourer) and Cecil (13, at school). Albert Oliver was entered on the 1918-19 list of Absentee Voters from Muston: Private 40220, C Company, 2nd Leicesters; his address “Green’s Lane”. It has been difficult to trace further details of his military service at present. However, he would have been eighteen in 1915, and so may have enlisted around that time. By 1918 he was probably engaged in the Palestine campaign. 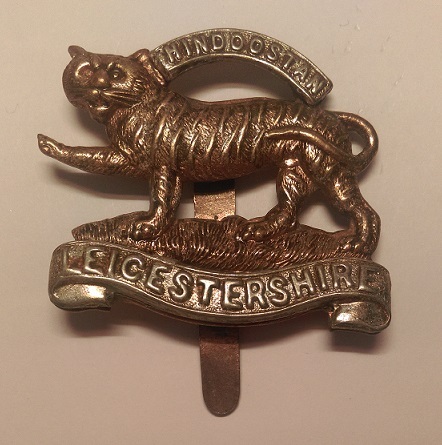 The 2nd Battalion of the Leicestershire Regiment was one of the pre-WW1 units of the Regular Army, and had been part of the 7th (Meerut) Division. After moving to the Western Front in 1914 it was transferred to Egypt and from there to Basra, late in 1915, rejoining the 28th Brigade in the 7th (Meerut) Division. It landed at Suez in January 1918 and took part in the Battle of Meggido (north of Jerusalem) in the Palestine campaign led by Sir Edmund Allenby. Details of Albert Edward Oliver’s life after the end of the war have not been found with any certainty. An Albert Edward Oliver died in the Basford area of Nottingham in 1977. If this was the man from Muston, he would have been 80. The date and place of his death are entered provisionally, and may have to be revised if new data become available.